Many riots take place during the summer months when the rioters are not at school or college. They have time on their hands, are often bored and don’t have to get up for anything the next morning. Facilities lie idle in schools for months on end – sports facilities, theatres, classrooms – as they are mothballed during long holidays. Kids find themselves with little to do, especially te poor, who can’t afford holidays and travelling. The cost of holidays is pushed beyond many poor parents because travel companies push up prices during the school holidays, leaving and poor to amuse themselves on the streets. The cost of education is artificially high because the capital and maintenance budget is not spent wisely. For months of the year these buildings are largely empty. Summer is a time for forgetting. We know that the long summer hols set back students, especially those from poorer background with less home support in learning. This in turn leads to low achievement and disaffection. Pushing irrelevant educational content, such as the more esoteric portions of the maths curriculum, literary criticism and Latin, is a recipe for further disaffection with schools. The educational apartheid and failure to give vocational learning the status it deserves leads to perceived failure by those who do not have an academic bent, again leading to disaffection. Now we know that there’s a need for better education and training. Surely we could find a way to add a fourth semester to school and colleges, to make better use of the assets, reduce the cost per student and get on with solving some of the problems in our society. I’ve already blogged a good example of how this could be achieved through practical, vocational, learning opportunities that sweat existing, unused facilities. 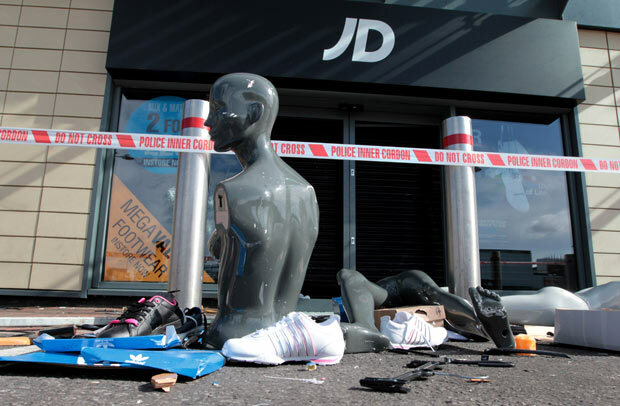 Isn’t it also ironic that the rioters shop of choice is JB Sports and their loot of choice sportswear and the irony that these riots took place in the shadow of the Olympic build. The rhetoric is all about participation in sport, yet the youth clubs in these areas are being shut down. This has been a lost opportunity. We could have used the Olympics as a means to create tens of thousands of apprenticeships and encouraged participation in sport through local initiatives. My kids have been training all summer in Tae Kwon do. It’s kept them fit and occupied. Note that this has nothing to do with school and PE – the PE teachers are all on holiday and the school facilities locked up. In fact the classes normally run in my two nearest schools have stopped because the schools are closed! This is madness. Last night I saw the fruits of what I regard as an ideal educational experience, run during the school holidays, yet none of the participants or observers would have seen it as ‘educational’ in any sense. Here’s what happens. Seventy to eighty kids attend a five day event called ‘Rockshop’ run by Herbie Flowers, who played with the likes of Lou Reed and David Bowie. He has several tutors who ‘tut’. On Monday morning they have a goal: write some songs and perform them live, to a paying audience, on Friday night. The tutors don’t deliver formal lectures or lessons, they simply facilitate the process, helping where and when they can. The whole point is to learn by doing. The kids learn together, from each other and from the tutors, as they write, refine, practice and perform real songs. What’s great is the fact that many of these kids work with people they’ve never met before, which teaches them social, communication and work skills. They learn with and from other people who are not in their normal peer group. They make new friends, in some cases I’m sure, lifelong friends. There’s kids from a range of social backgrounds; private schools, state schools and kids with special needs who have found they have a talent for paying an instrument, and the whole group clearly support each other (give or take some teenage ‘attitude’!). There’s classically trained violinists, singer song writers, mouth organists, jazz fans, drummers, base players, guitarists, keyboard players and brass players. And it’s cool if you’re not as good as the others – because they all know they’re there to learn, not to judge. They’re showing each other chords, base lines and twinning up on stage so the strongest can help smooth out the weakest. It’s all good. The goal brings focus, so forget about lack of concentration and attention. They’re full on, 9-5.30, then evenings at home. Many even popped out to busk at lunchtime! There’s no need for formal assessment as it’s all about real performance. This is what brings out the best in these teenagers is that the pressure comes not from the exam but something they care deeply about, their own performance and competence. And boy did they respond. Friday night came and a sell-out audience, largely the friends and relatives of the performers, was waiting eagerly – no expectations then! I was particularly impressed by the number of young people in the audience who were there to see and support their friends. My lad had his parents, grandparents, two cousins and a friend watching – that’s pressure. But it was the whole family thing that made it work. Suddenly it was cool to have worked hard and practised. It was cool to learn. The quality of the songs was outstanding both lyrically and in musical composition. We had jazz, soulful ballads, a sophisticated live, looped composition, rock and folk. And the finale, with all of the kids on the stage rocking out with the audience on their feet, was great. The kids had busked at lunchtime and gave the cash to Herbie and he promised to use it to subsidise the tuckshop! But that’s not all. All the sessions and loads of photos will/have been uploaded to YouTube and Flickr. So the show goes on and performers, their family and friends can enjoy what they’ve achieved. It’s also archived for future use. For some kids, learning is best done out of the confines of school and exams, by professionals with real stature. Herbie’s one of those people, as is my son’s drum tutor Phil and their Tae Kwon Do master, Howard. None of these people have teaching qualifications, but they’re among the best teachers I know. These people have enriched my children’s lives and deserve all the support they can get. But what really fascinates me is the way in which institutional language and approaches are almost completely absent. There’s no talk of ’learners’ and ‘learning’. No one sees this as a course with lessons, sitting at desks and bells. There’s no ‘teachers’ just tutors who, as Herbie says ‘Tut don’t teach’. And there’s no written exam, just pure performance where everyone walks away with an experience they’ll remember for the rest of their lives, having grown as people, in terms of confidence and competence. I have to declare an interest here as I’m the Deputy Chair of the Brighton Dome and Festival (a Concert Hall, two additional theatres and England’s largest annual arts Festival). Our wonderful Educational Director, Pippa Smith, supports this event which is run every year. There needs to be more of this during the summer months.